From traditional hospital deliveries to water and homeopathic births, there are many different ways to give birth. Among these options are the surgical procedures best known as C-sections. Surgical delivery methods are frequently used to prevent harm to the mother and/or baby in emergency cases, like arrested labor or fetal distress. In cases such as these, cesareans are performed for a safer delivery. Some mothers opt for a C-section when no emergency is present, simply as a preferred alternative to a traditional vaginal birth. The traditional C-section, also known as the classic C-section, involves making a vertical incision to the middle of the abdomen. The uterus is cut in the same manner and direction, long and vertical, to provide adequate room for delivering the baby. This type of C-section presents potential post-surgical complications, such as the weakening of abdominal muscles. Additionally, there is a risk of uterine rupture to mothers who opt for vaginal deliveries after previous C-section births. Traditional C-sections are usually reserved for emergency cases like premature births, babies in fetal distress, or babies with abnormalities. A lower segment C-section (aka, lower uterine segment) involves making a horizontal incision directly above the bladder. The incision goes through the skin and the uterine wall, through which a doctor’s hands can pull out the baby. The wound left behind from this type of C-section often heals better than that left behind from the classic form, and there is very little risk of uterine rupture in subsequent deliveries. 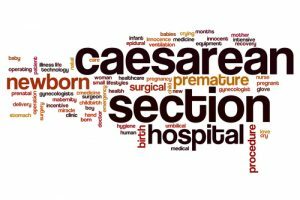 Lower segment C-sections are the most common cesareans performed today. Alternately, a low vertical uterine C-section involves an incision to the same area above the bladder but in a vertical rather than horizontal direction. The low vertical uterine surgery may be performed when factors such as the baby’s size or position in the womb prevent another kind of incision from being made. Finally, a cesarean hysterectomy involves removing the uterus during the C-section procedure. This emergency surgery may be necessary during an emergency delivery, such as when the placenta has embedded into the uterine wall or heavy, uncontrolled bleeding is present. Generally, C-sections in non-emergency situations take between forty minutes and one hour to complete, and your partner is usually welcome to stay in the room with you during the procedure. Once your abdominal area is cleaned and the proper medication and fluids have been administered, you will be given a regional anesthesia. Patients are generally awake for C-section procedures. The incision and delivery should go smoothly for both you and the baby, provided your doctor is organized and professional. Occasionally, something does go wrong in the delivery room during the surgery. Examples include broken bones, oxygen deprivation, wounds to the baby caused by medical tools, inadequate surgical wound closure, and lacerated bowels. Such mistakes can (and should) be prevented, but they nevertheless do occur. Serious complications and birth injuries may arise from the negligence of medical professionals during any surgical procedure, including C-sections. If you, your baby, or someone you know has been the victim of a flawed birth surgery, contact Thurswell Law today. Call our toll free number (866) 354-5544 to receive a free consultation. We will get you the justice and compensation you deserve, and we won’t charge a fee unless you collect.